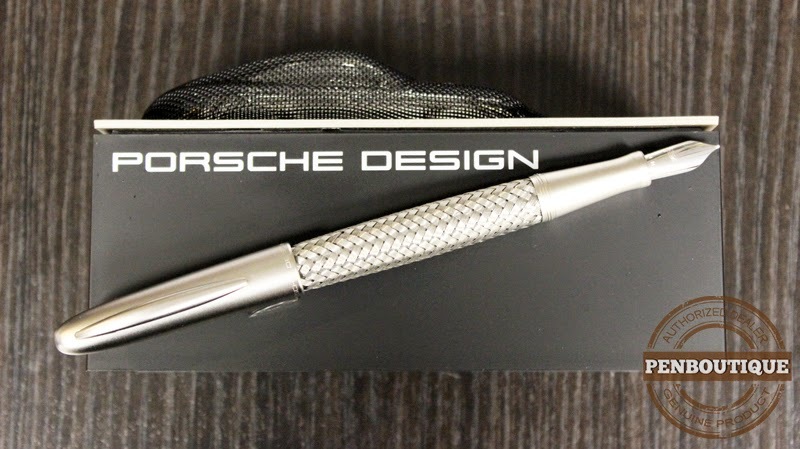 The Porsche Design TecFlex Fountain Pen is a head turner. One can’t help but notice the basket weave design of woven stainless steel covering the body of the pen. This design is reminiscent of the protective cabling used for the fuel and brake lines on Porsche automobiles. The non-weave portions of the pen are Palladium coated. The nib is rhodium plated 18k white gold and is available in Fine, Medium or Broad. A converter is included, though the pen is also compatible with international size cartridges. The TecFlex line includes three different color schemes – stainless steel, stainless steel and gold, and black. They can be had in Rollerball, Ballpoint or Pencil. The Ballpoint and Pencil are worth noting as their weave actually compresses when extending the refill or lead – very cool. The TecFlex Fountain Pen has a good weight to it – not too heavy, but not too light. It is also a good sized pen and is comfortable in the hand. The weight does seem to be concentrated to the rear, so I found it more balanced to leave the cap un-posted while writing. The 18k gold nib is a pleasure to write with, though it does seem to lay down a wet line. That being said, it is smooth as silk and starts and stops on command. The rear of the pen has three small protrusions, resembling ball bearings, which keep a sturdy hold on the cap when posted. This is easily one of the most attractive pens I have had the pleasure of handling and testing. If you are a car buff, or know someone who is, the Porsche Design TecFlex line is hard to beat. It looks good, writes well, feels substantial and has design cues taken straight from their vehicles! Even non-buffs will appreciate the workmanship and style that have gone into this line. Since the TecFlex is offered in all four writing styles, this line should be able to fulfill the requirements of anyone looking to add a quality piece to their collection.